Chess is played on a square board of eight rows (called ranks and denoted with numbers 1 to 8) and eight columns (called files and denoted with letters a to h) of squares. The colors of the 64 squares alternate and are referred to as "light squares" and "dark squares". 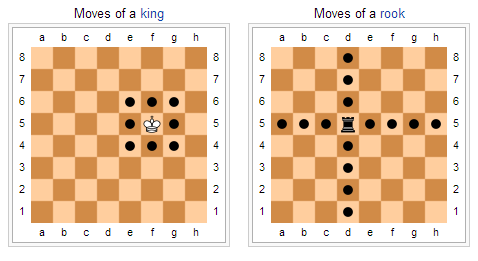 The chessboard is placed with a light square at the right-hand end of the rank nearest to each player, and the pieces are set out as shown in the diagram, with each queen on its own color. The pieces are divided, by convention, into white and black sets. The players are referred to as "White" and "Black", and each begins the game with 16 pieces of the specified color. 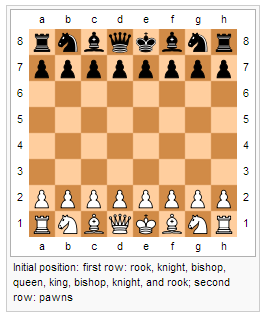 These consist of one king, one queen, two rooks, two bishops, two knights, and eight pawns. White always moves first. After the initial move, the players alternately move one piece at a time (with the exception of castling, when two pieces are moved). Pieces are moved to either an unoccupied square or one occupied by an opponent's piece, which is captured and removed from play. With the sole exception of en passant, all pieces capture opponent's pieces by moving to the square that the opponent's piece occupies. A player may not make any move that would put or leave his king under attack. 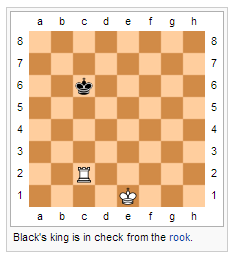 If the player to move has no legal moves, the game is over; it is either a checkmate (a loss for the player with no legal moves)—if the king is under attack—or a stalemate (a draw)—if the king is not. * Pawns can optionally move two squares forward instead of one on their first move only. 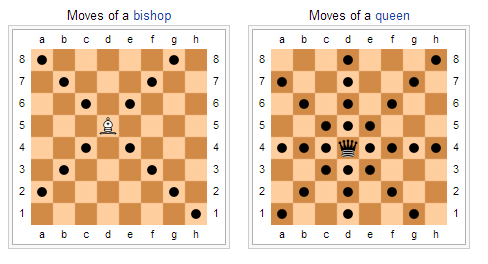 They capture diagonally (black "x"s); they cannot capture with their normal move (black dots). Pawns also are involved in the special capture called en passant. Although the objective of the game is to checkmate the opponent, chess games do not have to end in checkmate—either player may resign which is a win for the other player. It is considered bad etiquette to continue playing when in a truly hopeless position. If it is a game with time control, a player may run out of time and lose, even with a much superior position. Games also may end in a draw (tie). 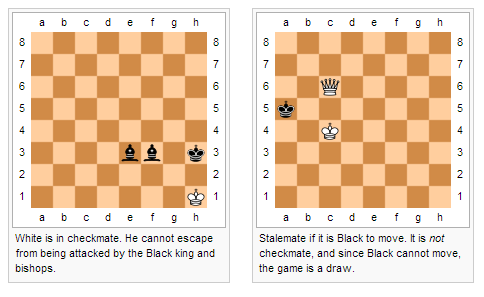 A draw can occur in several situations, including draw by agreement, stalemate, threefold repetition of a position, the fifty-move rule, or a draw by impossibility of checkmate (usually because of insufficient material to checkmate). 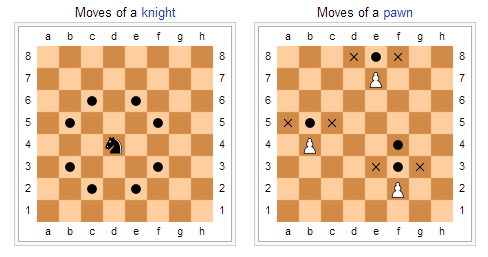 As checkmate from some positions cannot be forced in fewer than 50 moves (such as in the pawnless chess endgame and two knights endgame), the fifty-move rule is not applied everywhere, particularly in correspondence chess.